Owner financing is where the seller of a home provides the financing for the buyer instead of a mortgage company or bank. This is often the case where the buyer can’t obtain regular financing, or where they have a private arrangement with the seller. While these types of home sales arrangements can be beneficial, they may be the subject to a variety of disputes. Real estate transactions in Texas prior to 2008 didn’t have as many restrictions as today. It was extremely easy for sellers and buyers to enter into deals with creative financing programs. While owner financing is still a viable option today, sellers should work with experienced real estate attorneys to prevent a potential lawsuit. The laws dealing with owner financing have changed drastically and are state-specific, so generic forms from the Internet are likely a lawsuit in the making. Owner financing disputes can involve some highly complex and technical real estate laws. It is in your best interest to hire a real estate lawyer if you need help or representation regarding an owner financing arrangement. 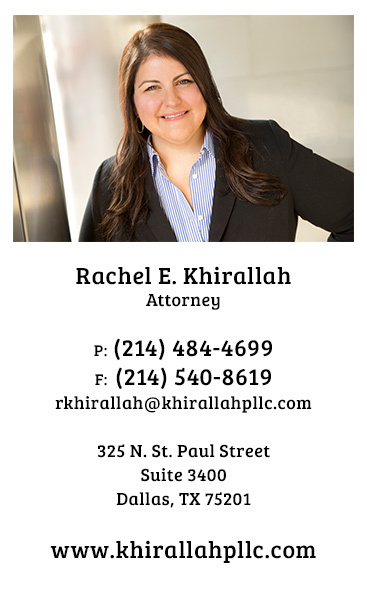 Ms. Khirallah can provide you with legal advice so that you understand what your options and rights are in the situation. She can analyze the documents to make sure the owner/seller followed the proper procedures so that you can make sure your investment is protected.